Editor's Note: Jan Chorlton and Barry Petersen met in a Seattle newsroom over 25 years ago and fell head over heels in love. They married and traveled the world – Barry as a CBS News correspondent and Jan as a reporter for several news organizations, including CNN. But their lives were shattered in 2005 when Jan was diagnosed with early onset Alzheimer's disease – at 55. In his new book, "Jan's Story: Love Lost to the Long Goodbye of Alzheimer's," Barry describes seeing his wife, and his life, disappear. 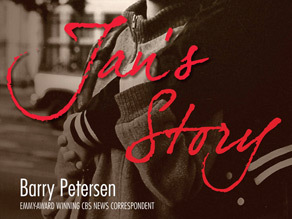 In his new book, ''Jan's Story: Love Lost to the Long Goodbye of Alzheimer's,'' Barry Petersen describes coping with a partner who has Alzheimer's. May I tell you the story of how I never proposed to Jan? No getting down on bended knee, no diamond ring in a box—because I was so broke after a divorce that I couldn’t afford a ring. No Jan sitting in some fancy restaurant, choking up, blurting out a joyful “Yes.” We had been friends for a while because she worked at the CBS TV affiliate in Seattle and I would travel there for stories, often working out of their newsroom. One evening . . . the first time she ever invited me to her tiny one-bedroom apartment overlooking Lake Washington . . . we sat and talked. It was never more than that . . . sorry . . . no scenes that censors would take out of the movie version. It was just that, somehow, we knew – both of us – that we would be together from then on, HAD to be together. I gently kissed her goodnight and walked away and felt as if I had been in an earthquake. I was shaken and elated, scared, but also ecstatic with the sense of being alive . . . I knew my life had changed in brilliant ways. We were married in San Francisco on Valentine’s Day in 1985, and then lived here and there across the globe . . . San Francisco, Tokyo, Moscow, London and back to Tokyo and Beijing. Thanks for sharing your story. I have a twin sister that had to be placed in a care facility because I was feeling the way you were feeling. Some of her friends just didn't understand the emotional strength one needs to care for someone in their home when they are no longer the person you knew, or you are doing it alone. I applaud you for your strength to make that decision. My husband, Frank, is in the latter stages of Alzheimer's Disease. This trip, so far, has lasted over 6 years, and is still going. This journey has been long, lonely, difficult, hopeless, depressing, financially devistating, tiring, grieving, to say the least. I understand every word Mr. Peterson has written and spoken. His words could have come from my own mouth, verbatum. I know the shoes in which he's walking because I too am walking in them. This disease is horrible for the victim, but even worse for the family and friends of the victim. The good thing is that the victim doesn't remember what is happening to him/her. It is the loved ones who experience the heartbreak, the anguish, seeing all the hopes and dreams they had built being dashed on the rocks, never to be realized. Thank you, Mr. Peterson, for your book and all the media attention involved. Maybe, somewhere, sometime, the "Powers That Be" will use their power to fund the research necessary to find a cure. I'm sure you join me in saying, "If the 'Powers That Be' were walking in our shoes they would more closely see the real picture and what is needed". May God bless you and yours each and every day. I just lost my mom to dementia in January. She was diagnosed with the disease at the age of 59. This was a whole world I had no concept of until my family and I embarked on this miserably painful and long 10-year journey. Like Barry, my father moved onto another relationship with a woman shortly after he moved my mother into an Alzheimer's Facility. Was I angry? Absolutely! Did I feel he betrayed her? Yes! Did it tear our family apart? You bet, for a few years. Do I have a better understand now why he did it? Yes, somewhat. And today, my dad and I have a greater appreciation of each other's feelings. It took a while, though. What I appreciate hearing from Barry is that he seems to have gained an understanding that loved ones react to this disease differently. It's very important to be empathetic to the variety of feelings and points-of-view that husbands, wives, daughters, sons, friends, aunts, uncles, and other loved ones have when faced with their relative/friend being diagnosed with a disease like Alzheimer's or another form of dementia. Losing a mother to dementia is of no less significance to losing a spouse. It's just different. I think that the way Barry processed anger directed at him for moving on as love for Jan was a healthy approach, and one that respects other points of view. Our family stumbled in this area. When my mom was first diagnosed, the social worker my brother, dad and I met with said that dealing with this disease separates the boys from the men. She couldn't have been more right about that. God bless you, Barry, and all the caregivers and family members who are going through their very long goodbyes with their own loved ones. My heart goes out to Barry and to all of Jan's friends. My father is in one of the last stages of Alzheimer's. It has been a very difficult road for my mother and devistating to all three of his daughters who think the world of him. He is the kindest, nicest man you will ever meet and this disease has taken every bit of dignity from him. I honestly don't know what I would do if diagnosed with this disease, because I would not want my husband to go through what my mother has gone through. My highly educated cowboy father would have rather walked into the woods and died on his own, before my mother became financially strapped and unable to retire. The father I knew is gone...he doesn't recognize me or my mother...and he is no longer with us. I don't blame Barry for moving on and I commend him for continuing to care for the person he knew and continues to love. My sister told me a phrase she heard when someone asked why the loved one continues to visit even though it is quite clear his wife does not recognize him. "I continue to visit, not because she remembers me, but because I remember her." What a senseless disease that needs a cure!!! Having a spouse, loving that person for years, and seeing that person fade away can have the most profound affect on the well spouse. Like Barry said in the interview, you worry, lose sleep, and barely function on a day to day basis. Still having to go to work, deal with coworkers and relatives who do not know what you are going through is tougher that anyone can imagine. Your spouse has been the center of your universe and suddenly that person can no longer relate to any of the feelings you have shared or remember those special events and times you and your family had over the years. Whether it is Alzheimer's or a head injury from an accident, people need to make a point of befriending the surviving spouse , if only to ease some of their burden. My heart goes out to Barry and also Jan's friends. They have all lost their loved one even though she still lives. Like he said, it's like losing that person over and over again. I saw Barry on Sunday morning and could not stop crying for him and Jan. I most definitely think he did the right thing by putting Jan in assisted living facility. He and his new friend see her often and we should not judge him for his decisions. Jan could live for another 20 years with this horrible disease. Take a look a Ronald Reagan. I pray for Barry & Jan and everyone else who has to deal with this. I have had to deal with it as well. Unless you have experienced this first hand, you should not judge. I am a home health nurse who takes care of people with Alzheimer's. This is a horrible disease that needs to be dealt with up close for ANYONE to REALLY understand what it is like for the caretaker and family. I think putting Jan into that facility was the best thing for both of them. He can regroup and be able to still go and see her and love her without dealing with the constant stress and worry of having her get hurt at home. As for his companion, having someone to help you cope with such a life, and love your loved one, shows a lot of compassion. Go for LIFE, every time. Can you imagine how Jan would have felt seeing Barry cry every time he comes to see her and being lonely at home? If it was me, I would say "Thank you for the wonderful life, and for still loving me, now go and have a life of your own." As for having told this story, it can help SO many people just KNOWING what others have gone through and how they cope. You would REALLY have to BE there...walk in his shoes...to even begin to understand. Maybe it is just me, but am I the only one who saw the part where he takes his new paramour to visit Jan? And I find it disingenuous for Barry to suggest that his wife approves of this decision when he states that she calls his new lover her friend. Either Jan is "there" or she is "not there" due to Alzheimer’s, he can't have it both ways. Also, his wife was a professional in her own right, does he consider whether it would have been Jan's wishes to have her story told in such a public manner? I noted in the CBS piece that one woman interviewed, specifically stated that she would not want her grandchildren to visit her as she did not want them to see her decline. This interview that John Roberts had with Barry Petersen was excellant. I saw the start of the interview this morning before I went to wrok. But had to leave , to go to work. Picked it up tonight on the CNN website. I have friends that have p;rents with Alzheimer's. One wished her Dad a Happy Fathers' Day, and he commented," What is that?" She told me personally. So sad. Hope and pray to find a cure for this devestating disease. My heart goes out to any family having to deal with this. I know how you must feel as my wife of 53 years has mild Alzheimer's and I can see her suffering to remember each day and myself as well starting to feel exhausted doing the most menial tasks around the home. If you are a Congressman reading this then you must get help passed thru to assist in a cure for this debilitating disease. You can almost be guaranteed that one of your family will become diagnosed with Alzheimers. Instead of these stimulous packages being given to banks, auto manufacturer's, illegal immigrants, and to individuals that are ripping off the medicaide system, give that money to science to come up with a cure before the entire population of those over 45 also lose their brains. Having worked as a Caregiver in facilities for the elderly has given me much respect and appreciation of life and I'm glad this man is writing their story so people can see what this disease robs people of a happy ending to their lives after working so hard. We must live life to the fullest and make great memories. I just read the excerpt and I am already devastated. I feel so sorry for anybody who has to go through this. I feel for Jan and Barry. Early on-set Alzheimers also runs in my family and I've watched an Uncle, Aunt and now two brothers succumb to it. In our family, personality changes start showing between 40 and 45, so if we make it to 50 we feel very fortunate. I'm almost 60 and I have one brother left who is 53 and not showing signs. My heart goes out to Barry and his story. It's a heartbreaking disease. Barry – I am terribly sorry for what you are going through. I could only imagine. You have such amazing memories that not a lot of couples can talk about...and yet, the memories are something she can no longer verify. And even if you remember them, it hurts that the most special person in those scenes no longer remember them. The memories can sometimes render useless to you now. I am so stunned! I went to high school with Jan. I remember when she was on the CBS affiliate here in Seattle. This is so wretched – my heart goes out to Barry! My heart aches for you and Jan. I hope you find a place of peace to rest your weary head. The suffering caused by Alzheimer's wrath is earth shattering. Be kind to yourself. I'm certain Jan would agree. My heart goes out to you. Take care of yourself and do everthing you can to live and honor the love and joy you two shared. This is what I fear. There is Alzheimers in my husbands family and he is such a brilliant man. But I worry that someday soon I will be faced with the same thing. He's 63 now and every time he messes up a name or forgets something – I start to wonder if it's happening. I wish the best for Barry Petersen and Jan. I pray that I never know first hand of their heartache. Jesus can be your strength. He says to seek him out and ye shall find. Read the Bible and pray for his help. I wish I could get my dad to read that book. My mom was diagnosed with Alheimers a couple of years ago. I don't know the exact day because he didn't tell me till just six months ago. I think he is in denial. It is just hurting everybody more because of the denial. Such a sad and hopeless story. Jan's problem is probably part genetic, part stress, and part diet. And given that she loved the life she lived the only one she could change was diet and its too late for her probably to get better now. I hope some drug can do the trick but I haven't read that any of the new procedures to deal with Alzheimer's are ready to go yet. Perhaps soon and then Barry will get to keep his soul and get back his wife all at the same time. My heart goes out to Barry for this tragedy to this beautiful person who was and is still his wife. What I don't understand the part where he said he has started a new life with a new partner. I think it's commendable for this person to help Barry with his wife but what happened to "until death do we part". I put myself in Barry's wife shoes and I thought how could he just send me away to die this horrible death while he continues on making a new life for himself before I'm gone. What happened to the marriage vowels they made in 1985. I know taking care of a person with this dreaded disease is horrible and I know that life must go on but before she dies? Maybe this is why some of their friends became angry for him to put her in assisted living...so he can carry on with his life!